THE STORY OF THE DECEMVIRS AND OF VIRGINIA. It was agreed between the nobles and the Commons that, to make an end of disputing about the laws, ambassadors should be sent into Greece, and especially to Athens (which city and its lawgiver, Solon, were held in high repute in those days), to learn what manner of laws and customs they had, and to bring back a report of them. And when the ambassadors had brought back their report, it seemed good to the people that in the following year there should be appointed neither consuls nor any other magistrate, but decemvirs only; that is to say, ten men, who should set in order the laws of Rome. Thus it came to pass in the ninety and first year from the driving out of the kings, that decemvirs were appointed in the stead of consuls, Appius Claudius being the chief of the ten. For a while these pleased the people well, doing justice equally between man and man. And the custom was that each day one of the ten sat as judge with the twelve lictors about him, the nine others sitting with one minister only. Also they busied themselves with the ordering of the laws; and at last set forth ten tables on which these were written. At the same time they called the people together to an assembly, and spake to them thus: "The Gods grant that this undertaking may turn to the credit of the State, and of you, and of your children. Go, therefore, and read these laws which we have set forth; for though we have done what ten men could do to provide laws that should be just to all, whether they be high or low, yet the understandings of many men may yet change many things for the better. Consider therefore all these matters in your own minds, and debate them among yourselves. For we will that the Roman people should be bound by such laws only as they shall have agreed together to establish." The ten tables were therefore set forth, and when these had been sufficiently considered, and such corrections made therein as seemed good, a regular assembly of the people was called, and the laws were duly established. But now there was spread abroad a report that two tables were yet wanting, and that when these should have been added the whole would be complete; and thence there arose a desire that the Ten should be appointed to hold office a second year. This indeed was done; but Appius Claudius so ordered matters that there were elected together with him none of the chief men of the State, but only such as were of an inferior condition and fortune. After this the Ten began more and more to set aside all law and right. Thus whereas at the first one only on each day was followed by the twelve lictors, each of the ten came daily into the market-place so attended; and whereas before the lictors carried bundles of rods only, now there was bound up with the rods an axe, whereby was signified the power of life and death. Their actions also agreed with this show, for they and their ministers plundered the goods and chattels of the people. Some also they scourged, and some they beheaded. And when they had so put a man to death, they would divide his substance among those that waited upon them to do their pleasure. Among their misdeeds two were especially notable. There was a certain Sicinius in the host, a man of singular strength and courage, who took it ill that the Ten should thus set themselves above all law, and was wont to say to his comrades that the Commons should depart from the city as they had done in time past, or should at the least make them tribunes to be their champions as of old. This Sicinius the Ten sent on before the army, there being then war with the Sabines, to search out a place for a camp; and with him they sent certain others, bidding them slay him when they should have come to some convenient place. This they did, but not without suffering much loss; for the man fought for his life and defended himself, slaying many of his enemies. Then they that escaped ran into the camp, saying that Sicinius had fallen into an ambuscade, and had died along with certain others of the soldiers. At the first, indeed, this story was believed; but afterwards, when, by permission of the Ten, there went some to bury the dead, they found that none of the dead bodies had been spoiled, and that Sicinius lay with his arms in the midst, the others having their faces towards him; also that there was no dead body of an enemy in the place, nor any track as of them that had gone from the place; for which reasons they brought back tidings that Sicinius had certainly been slain by his own comrades. At this there was great wrath in the camp; and the soldiers were ready to carry the body of Sicinius to Rome, but that the Ten made a military funeral for him at the public cost. So they buried Sicinius with great lamentation; but the Ten were thereafter in very ill repute among the soldiers. Again, there was a certain centurion, Lucius Virginius by name, an upright man and of good credit both at home and abroad. This Virginius had a daughter, Virginia, a very fair and virtuous maiden, whom he had espoused to a certain Icilius that had once been a tribune of the Commons. On this maiden Appius Claudius, the chief of the Ten, sought to lay hands, and for this end gave commandment to one Marcus Claudius, who was one of the clients of his house, that he should claim the girl for a slave. On the morrow therefore as Virginia passed across the market-place, being on her way to school (for the schools in those days were held in the market-place), this Claudius seized her, affirming that she was born of a woman that was a slave, and was therefore by right a slave herself. The maiden standing still for fear, the nurse that attended her set up a great cry and called the citizens to help. Straightway there was a great concourse, for many knew the maiden's father Virginius, and Icilius to whom she was betrothed. Then said Claudius, seeing that he could not take her by force, "There is no need of tumult or of gathering a crowd. I would proceed by law, not by force." Thereupon he summoned the girl before the judge. When they came to the judgment-seat of Appius the man told a tale that had already been agreed upon between the two. "This girl," he said, "was born in my house, and was thence secretly taken to the house of Virginius, and passed off on the man as his daughter. Of this I will bring proof sufficient, such as will convince Virginius himself, who doubtless has received the chief wrong in this matter. But in the meanwhile it is reasonable that the slave should remain in the house of her master." To this the friends of the girl made answer, "Virginius is absent on the service of the State, and will be here within the space of two days, if tidings of this matter be sent to him. Now it is manifestly wrong that judgment concerning a man's children should be given while he is himself absent. Let the cause, therefore, be postponed till he come. Meanwhile let the maiden have her freedom according to the law which Appius and his fellows have themselves established." Appius gave sentence in these words: "That I am a favourer of freedom is manifest from this law of which ye make mention. Yet this law must be observed in all cases and without respect of persons; and as to this girl, there is none but her father only to whom her owner may yield the custody of her. Let her father therefore be sent for; but in the meanwhile Claudius must have custody of her, as is his right, only giving security that he will produce her on the morrow." At this decree, so manifestly unrighteous was it, there was much murmuring, yet none dared to oppose it, till Numitorius, the girl's uncle, and Icilius came forth from the crowd. The lictor cried, "Sentence has been given," and bade Icilius give place. Then Icilius turned to Appius, saying, "Appius, thou must drive me hence with the sword before thou canst have thy will in this matter. This maiden is my espoused wife; and verily, though thou call hither all thy lictors and the lictors of thy colleagues, she shall not remain in any house save the house of her father." To this Appius, seeing that the multitude was greatly moved and were ready to break forth into open violence, made this reply: "Icilius cares not for Virginia, but being a lover of sedition and tumult, seeks an occasion for strife. Such occasion I will not give him to-day. But that he may know that I yield not to his insolence, but have regard to the rights of a father, I pronounce no sentence. I ask of Marcus Claudius that he will concede something of his right, and suffer surety to be given for the girl against the morrow. But if on the morrow the father be not present here, then I tell Icilius and his fellows that he who is the author of this law will not fail to execute it. Neither will I call in the lictors of my colleagues to put down them that raise a tumult. For this my own lictors shall suffice." So much time being thus gained, it seemed good to the friends of the maiden that the son of Numitorius and the brother of Icilius, young men both of them and active, should hasten with all speed to the camp, and bring Virginius thence as quickly as might be. So the two set out, and putting their horses to their full speed, carried tidings of the matter to the father. As for Appius, he sat awhile on the judgment-seat, waiting for other business to be brought before him, for he would not have it seem that he had come for this cause only; but finding that there was none, and indeed the people were wholly intent on the matter of Virginia, he departed to his own house. Thence he sent an epistle to his colleagues that were at the camp, saying, "Grant no leave of absence to Virginius, but keep him in safe custody with you." But this availed nothing, for already, before ever the epistle was brought to the camp, at the very first watch of the night, Virginius had set forth. When Virginius was come to the city, it being then early dawn, he put on mean apparel, as was the custom with such as were in danger of life or liberty, and carried about his daughter, who was clad in like manner, praying all that he met to help and succour him. "Remember," said he, "that day by day I stand fighting for you and for your children against your enemies. But what shall this profit you or me if, this city being safe, nevertheless our children stand in peril of slavery and shame?" Icilius spake in like manner, and the women (for a company of matrons followed Virginia) wept silently, stirring greatly the hearts of all that looked upon them. But Appius, so set was his heart on evil, heeded none of these things; but so soon as he had sat him down on the seat of judgment, and he that claimed the girl had said a few words complaining that right had not been done to him, he gave his sentence; suffering not Virginius to speak. What pretence of reason he gave can scarce be imagined, but the sentence (for this only is certain) was that the girl should be in the custody of Claudius till the matter should be decided by law. But when Claudius came to take the maiden, her friends and all the women that bare her company thrust him back. Then said Appius, "I have sure proof, and this not from the violence only of Icilius, but from what is told to me of gatherings by night in the city, that there is a purpose in certain men to stir up sedition. Knowing this I have come hither with armed men; not to trouble quiet citizens, but to punish such as would break the peace of the State. Such as be wise, therefore, will keep themselves quiet. Lictor, remove this crowd, and make room for the master that he may take his slave." These words he thundered forth in great anger; and the people, when they heard them, fell back in fear, so that the maiden stood without defence. Then Virginius, seeing that there were none to help him, said to Appius, "I pray thee, Appius, if I have said aught that was harsh to thee, that thou wilt pardon it, knowing how a father must needs suffer in such a case. But now suffer me to enquire somewhat of this woman that is the girl's nurse, that I may know what is the truth of the matter. For if I have been deceived in the matter, and am not in truth father to the girl, I shall be more content." Then, Appius giving permission, he led his daughter and her nurse a little space aside, to the shops that are by the temple of Cloacina, and snatching a knife from a butcher's, said, "My daughter, there is but this one way that I can make thee free," and he drave the knife into her breast. Then he looked back to the judgment-seat and cried, "With this blood, Appius, I devote thee and thy life to perdition." There went up a great cry from all that stood there when they saw so dreadful a deed, and Appius commanded that they should seize him. But no man laid hands on him, for he made a way for himself with the knife that he carried in his hand, and they that followed defended him, till he came to the gate of the city. Then Icilius and Numitorius took up the dead body of the maiden and showed it to the people, saying much of the wickedness of him who had driven a father to do such a deed, and much also of the liberty which had been taken from them, and which, if they would only use this occasion, they might now recover. As for Appius, he cried out to his lictors that they should lay hands on Icilius, and when the crowd suffered not the lictors to approach, would himself have made a way to him, by the help of the young nobles that stood by him. But now the crowd had leaders, themselves also nobles, Valerius and Horatius. These said, "If Appius would deal with Icilius according to law we will be securities for him; if he mean to use violence, we are ready to meet him." And when the lictor would have laid hands on these two the multitude brake his rods to pieces. Then Appius would have spoken to the people, but they clamoured against him, so that at last, losing all courage and fearing for his life, he covered his head and fled secretly to his own house. Meanwhile Virginius had made his way to the camp, which was now on Mount Vecilius, and stirred up the army yet more than he had stirred the city. "Lay not to my charge," he said, "that which is in truth the wickedness of Appius; neither turn from me as from the murderer of my daughter. Her indeed I slew, thinking that death was better than slavery and shame; nor indeed had I survived her but that I hoped to avenge her death by the help of my comrades." Others also that had come from the city persuaded the soldiers; some saying that the power of the Ten was overthrown, and others that Appius had gone of his own accord into banishment. These words so prevailed with the soldiers that, without any bidding from their generals, they took up their arms, and, with their standards carried before them, came to Rome and pitched their camp on the Aventine. Nevertheless, the Ten were still obstinate, affirming that they would not resign their authority till they had finished the work for which they had been appointed, namely, the drawing up of the twelve tables of the laws. And when the army perceived this they marched from the Aventine and took up their abode on the Sacred Hill, all the Commons following them, so that there was not left in the city a single man that had ability to move; nor did the women and children stay behind, but all, as many as could move, bare them company; for Duilius, that had been tribune, said, "Unless the Senate see the city deserted, they will take no heed of your complaints." And indeed, when these perceived what had taken place, they were more urgent than before that the Ten should resign their office. And these at last consented; "Only," said they, "do not suffer us to perish from the rage of the Commons. It will be an ill day for the nobles when the people shall learn to take vengeance on them." And the Senate so wrought that though at the first the Commons in their great fury demanded that the Ten should be burned alive, yet they were persuaded to yield, it being agreed that each man should be judged by the law according to his deserts. Appius, therefore, was accused by Virginius, and being cast into prison, slew himself before the day appointed for the trial. Oppius also, another of the Ten, whom the Commons hated for his misdeeds next after Appius, was accused and died in like manner. 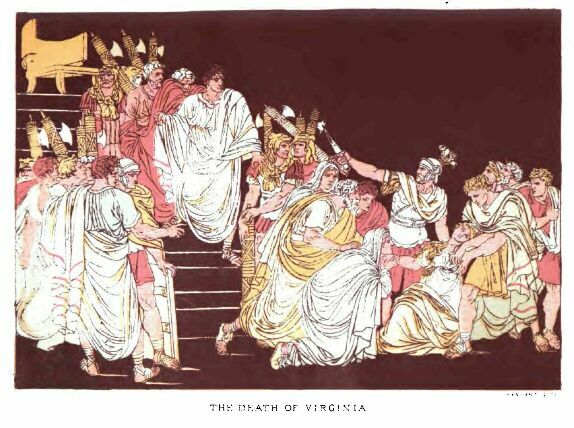 As for Claudius, that had claimed Virginia for his slave, he was condemned to be banished. And thus at the last, the guilty having been punished, the spirit of Virginia had rest.